Fat Tuesday, or Mardi Gras – the day when people wear costumes, engage in debaucherous behavior, dance, throw a parade and then make out with lots of people while wearing rows of beads around their necks. This is otherwise known as the more prim and proper Shrove Tuesday in the UK. Instead of copious amounts of booze and sleaze, it is a holiday where one eats…pancakes. It is like the sad, tame PG-13 version of Mardi Gras. This is a little unfortunate, as the UK version of pancakes is also a thinner, sadder version of American pancakes: they tend to be thin crepes and to create a formidable stack, it would take at least 50 to look impressive. Sift the flour, baking powder, salt and sugar into a bowl. Put the egg yolks, sour cream, milk and cooled melted butter into a second bowl and beat well, then add the flour mixture all at once and beat until smooth. Put the egg whites into a clean bowl and beat until soft peaks form. Fold them gently into the batter, then fold in the blueberries. Don’t overmix – a few lumps of flour and egg white don’t matter. Heat the prepared griddle or skillet over medium heat. Reduce the heat. 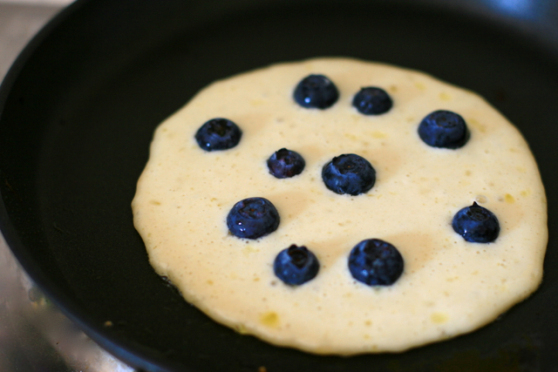 Pour about 3 tablespoons of batter into the pan and cook in batches of 3-4 for 1-2 minutes over very low heat to avoid burning the blueberries, until small bubbles begin to appear on the surface and the underside is golden brown. Turn them over and cook the other side for 1 minute. Transfer to a plate and keep them warm in a low oven while you cook the remainder. A quick note on the butter – melt it over a low heat in a saucepan BEFORE YOU DO ANYTHING ELSE. Once it’s mostly melted, whack it in the fridge to cool down while you prepare everything else. If you don’t do this, the butter will curdle in the super-cold milk and sour cream, making some of your pancakes too butter-filled. If you do this first, you’ll avoid the frustration of beating crystals of butter into your too-cold liquid mix. (It’s futile, and you’ll never get it incorporated). Also, I like to leave the berries out of the actual batter mix. I spoon my mixture into my pan, and once it’s beginning to set, I add the blueberries one-by-one. This tends to give a bit of pancake-barrier that prevents them from bursting as they’re not in direct contact with the heat of the pan. These are pretty sweet on their own, but they’re great with a bit of maple syrup, sugar & lemon, or golden syrup. Stack them all up (if you can keep yourself from nibbling whilst cooking!) 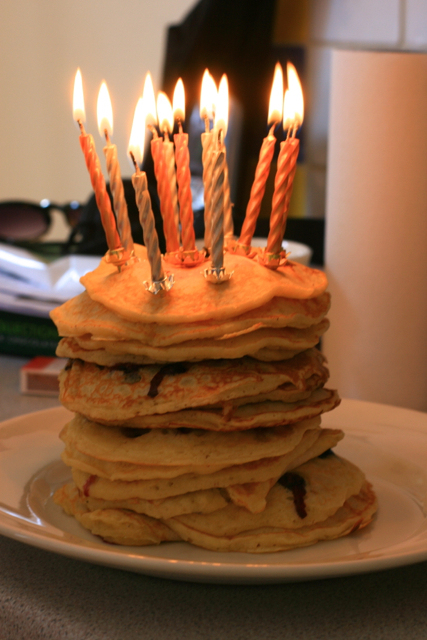 and stick in some candles – and there you have it, a pancake-cake, suitable for your special someone’s birthday morning or the best Pancake Tuesday ever!